Setanta supply a complete range of safety products from fall arrest bags and safety nets to smartguards and lightweight work platforms. 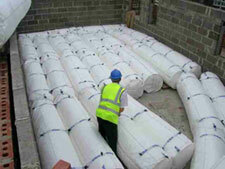 One of the major causes of injury on building and construction sites is falls from heights. The Health & Safety Executive now insists that the hierarchy of fall protection must be followed for all operatives working at height. Setanta Safety Mattress Systems can be delivered and erected one day prior to any operation involving personnel at height. Alternatively, they can be erected on the day, if the size of the project allows it. Effective Fall Protection in accordance with HSE. The installation processes is made simple by the modular components: however care should be taken to follow the safety guidelines . It has been fully tested in accordance with BS EN13374 (Class A) A temporary Edge Protection System. 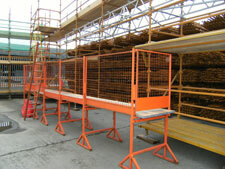 Setanta Building Products supplies a lightweight, versatile work platform. The Klik-fold Unit is 2 metres long, 70 cm wide and a platform height from 200mm to 1.9 metres, complete with guard rail. The Mini-Klik Fold is 1.5 metres long with a platform height up to 1.7m. Apart from the safety issue the klik fold unit saves a lot of time as it is much easier to work from. It folds up to go in through domestic doors, can be dismantled , moved to another room and erected in a matter of minutes. 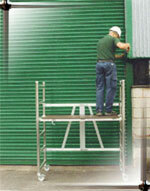 Suitable for internal and external work it can be folded up and carried in a small van or on a roof rack. No tradesman who needs to leave the ground to work should be without one. It will pay for itself in a short space of time. It comes complete with lockable castors access trapdoor and guardrail. Contact us on 087 983 0936 for more information. we will call you back immediately !! !